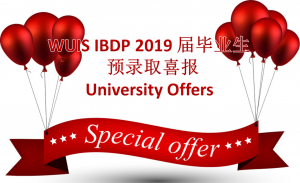 On Oct.29th, Muhan (Tina) WANG, one of the IBDP 2019 graduates at Wuxi United International School received the first conditional offer from University of Birmingham in UK. 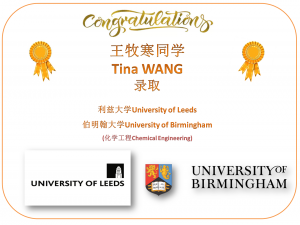 On November the 9th, Muhan Wang received another conditional offer, this time from the University of Leeds. Following these two letters of offers, the DP2019 cohort admission officially kicked off. So far our Grade 12 students have received 10 offers, from a range of universities in the UK and the Netherlands. Congratuations to the following students on their Universtiy offers. 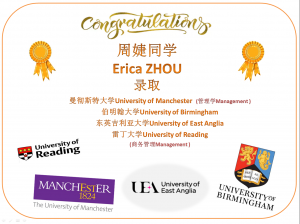 Jie (Erica) ZHOU has received offers of Business Management majors from the University of Manchester, University of Birmingham, University of East Anglia and University of Reading. 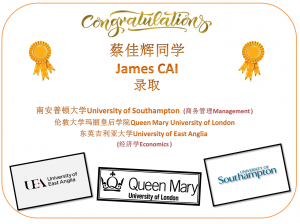 Jiahui (James) CAI has heard good news from the Queen Mary University of London, University of East Anglia in Economics major as well as from University of Southampton in Business Management major. 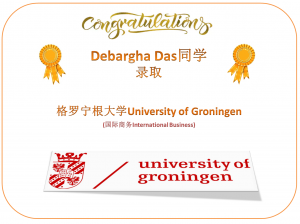 Debargha Das has received his first offer, from the University of Groningen, the Netherlands. The University of Groningen (RUG for short), founded in 1614 in the northern Dutch city of Groningen, is one of the oldest universities in the Netherlands, one of the top 25 universities in Europe. From this university came the first female student and the first female lecturer of the Netherlands, the first Dutch astronaut and the first president of the European Central Bank. The University provides students with high quality education and research in a broad range of disciplines, focusing on three main areas: Energy, Healthy Ageing and Sustainable Society. Groningen researchers also collaborate with business partners, public institutions and government. The University of Groningen enjoys a high reputation in the world: its School of Economics and Business is ranked by EQUIS as one of the top 1% of business schools in the world. 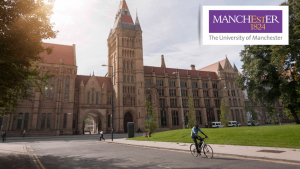 The University of Manchester is a world-class University with a glorious history. The school has a strong international reputation (29th in the world and has 25 Nobel Prize winners). It is worth mentioning that Manchester Business School is the golden school with many famous alumni and ranks in the Top 30 of the world business school rankings. At present, there are more than 40,000 students studying in more than 500 departments or programs, with more than 10,000 staff and an annual budget of 600 million pounds. According to The Times, “the University of Manchester has a respectable reputation in almost all disciplines, with life sciences, engineering, humanities, economics, sociology and social sciences topping the list.” The university library of Manchester has the third largest collection of books in the UK, after Oxford University and Cambridge University. University of Birmingham, founded in 1825, is one of the world’s top 100 universities located in Birmingham, the second largest city in Britain. It was the first member of Britain’s six famous “Red Brick Universities” and the core member of the “Russell Group “. In QS World University Rankings, it was in 79th. It ranks 2nd of Physics and Astronomy major, 4th of Chemical Engineering major and 5th of Computer Science major in TIMES University Rankings. The business school is the earliest business school established in the UK higher education, and it is the top 1% elite business school in the world certified by AACSB, AMBA and EQUIS. 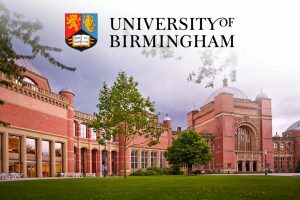 At the same time, the University of Birmingham is very strong in the fields of medicine and biological science, among which the employment rate of biological science major is second only to that of Cambridge University. By the end of 2017, the University of Birmingham has produced 11 Nobel Prize winners, three British prime ministers and five foreign heads of government. The University of Leeds, one of the top 10 UK universities, is a member of Russell group, a group of UK universities with strong research qualifications. It was founded in 1904 in Leeds, in the north of England. The University of Leeds has one of the largest campuses in the country and is a green community of music halls, galleries and restaurants. It is the top comprehensive university in the UK, enjoying a high international reputation in teaching, scientific research and employment. It has been ranked in the top 10 of the UK for many times. In 2019 QS world university rankings ranked 93rd.The business school is the world’s top business school certified by AACSB, EQUIS and AMBA. 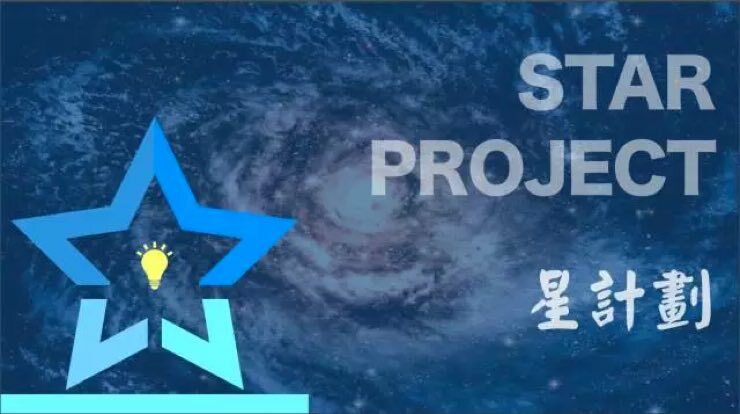 It has cultivated numerous business elites such as Chairman of HSBC Group, Chairman of Unilever, Chairman of Deloitte and Chief Financial Officer of Rolls-Royce. The University of East Anglia (UEA) is an internationally renowned university that provides high-quality academic, community and cultural facilities for more than 15,000 students. The university has been rated as one of the best student review universities in the UK and recently as the best campus environment in the UK (Times Higher Education 2016). 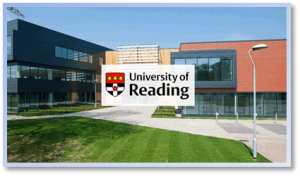 The University of Reading is one of the leading research-intensive universities in the UK and one of the Top 200 universities in the world (QS World University Rankings 2018). The university offers more than 150 postgraduate courses, the highest level of teaching, and offers a wide range of opportunities for students from studying abroad to learning languages to working as interns. Henley Business School at the University of Reading enjoys the “AACSB, AMBA and EQUIS triple certification”. 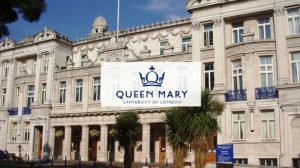 Queen Mary University of London is one of the top universities in the UK. In the latest QS rankings, Queen Mary has been ranked among the top 100 universities in the world. It is also a member of the Russell Group. Queen Mary is located in east London with a beautiful campus and complete facilities. The university currently has 18,000 international students from 151 countries and offers more than 240 degree programs in the humanities, social sciences and law, medicine and dentistry, science and engineering. Of these, more than 4,200 are enrolled in graduate programs or in research. The University of Southampton is a world-class university located on the southwest coast of England. It is a founding member of the Russell Group. Currently, the school has more than 6,500 international students from more than 135 countries. On May9, 2013, the University of Southampton, together with Oxford University, the University of Cambridge, Imperial College London and University College London jointly sponsored and established the Science and Engineering South Consortium, which is Britain’s top scientific union and one of the world’s leading research centers.